Note: I'm working on an update for this app. If you'd like to be notified when a new version is available, please join my idev101 mailing list. This is a quick-reference app for iOS developers. It's packed with useful tools and resources including a color picker, complete font list and type tester, printable app design templates, an interactive app submission checklist, and more. Convert to/from CSS hex values. 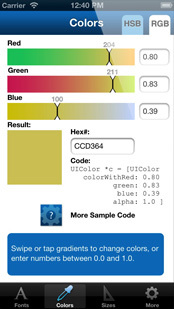 You can enter a CSS hex color value and get the corresponding RGB or HSB values. This makes converting to and from HTML/CSS colors extremely easy... great for designers! App design & code by Kira. Check out my other apps! Special thanks to Steven Marsh for app testing.